The Central Basin Recycled Water Program annually delivers 4,500 to 5,500 acre-feet, or an average of 1.6 billion gallons, of recycled water to more than 300 industrial, commercial, and landscape irrigation connections throughout southeast Los Angeles County. Established in the 1990’s and expanded over time, the recycled water distribution system includes over 80 miles of purple pipeline and four pump stations. The pump stations include the Rio Hondo Pump Station, Hollydale Pump Station, Cerritos Pump Station owned by the City of Cerritos, and Cudahy Pump Station. The distribution system provides recycled water to the cities of Bell, Bellflower, Bell Gardens, Commerce, Compton, Cudahy, Downey, Huntington Park, Lakewood, Lynwood, Norwalk, Paramount, South Gate, Vernon, Pico Rivera, Montebello, Santa Fe Springs and Whittier. Central Basin obtains recycled water from the San Jose Creek Water Reclamation Plant in Whittier and the Los Coyotes Water Reclamation Plant in Cerritos. 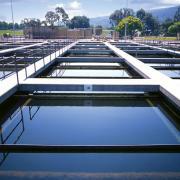 Owned and operated by the Sanitation Districts of Los Angeles County, these two reclamation plants produce effluent that meets the most stringent requirements for water recycling and recycled water reuse. Central Basin Municipal Water District | 6252 Telegraph Road | Commerce, CA 90040-2512 | Tel: 323.201.5500 | FAX: 323.201.5550 | Employee Email Access | Employee Timesheet Access | SitemapCentral Basin Municipal Water District | All Rights Reserved | Powered by CivicLive | © 2019 West Corporation.